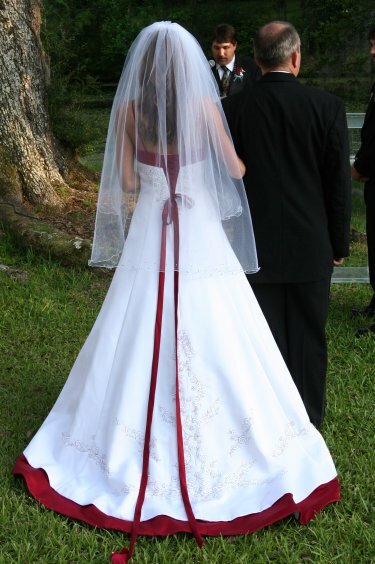 For my daughter's wedding she had dreamed of the perfect wedding gown for years. Alfred Angelo came out with a line of wedding gowns that incorporated color just in time, because I thought for sure we'd have to make the dress that she, from the time she was 13 years old, had described to me. The gown in the picture above was 'her dress'! It has the red border around the top and bottom with a red lace up back. Her wedding gown was perfect in that it was her dream dress and also perfect for the garden wedding. It was made of a material that was somewhat lightweight, it had a short train (best for grassy areas), and it left the shoulder's bare which gave the warm weather look for an outdoor wedding on a warm spring day. Now I'm not saying that it will be an easy task, but I know that you can find the perfect wedding gown for you too. Let me suggest that the time of year and location of the wedding be considered when choosing. Sparkly gowns look best in the glow of a night wedding. Thick fabrics, of course, don't do well in the hot summer, and the formality of your wedding plays a big factor too. If you don't have a clue about fabric choices, I would suggest that when you go to the bridal shop you tell the consultant that you would like to see some gowns in a fabric suitable for the time of year of your wedding. Then there's the sleeve option. This too, can be determined by the time of year and also by your own preference. There are at least eleven different kinds of sleeve ranging from strapless to a fitted point at the wrist. I will caution you to be sure, if you are getting married in a church or synagogue, that a sleeveless dress is allowed. As old fashioned as you may think, some still have modesty rules that require a sleeve and a totally covered chest. The length of the gown will be dictated by the formality of the ceremony. There are three lengths that are most common. These are the floor or full length, tea length, and knee length. The floor length is a must for a very formal wedding and the knee length is super appropriate for the casual or second wedding. There are lots of other things that can be discussed about the wedding gown choices, but what it all boils down to is that you look great in the dress and that you feel like you couldn't look better. 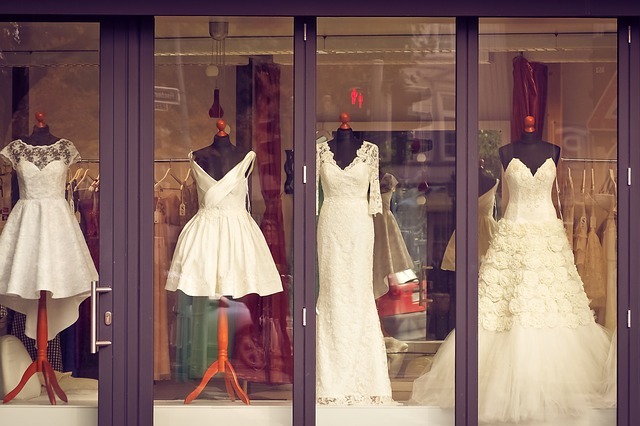 Don't be afraid to ask all about all the different choices you have when you visit the bridal shops. These are the experts and they will help you look your best. When you find the perfect wedding gown, you don't necessarily have to buy your dress at the shop when you find it. The consultant will let you try it on and will tell you what size you need the dress in. From there you can comparison shop. You may very well run across the same dress in the classified ads of your local paper or at the nearby consignment shop. So don't limit yourself and know that you have truly shopped for the best deal before actually buying your dress. Oh yea, one last piece of advice; "Don't forget the budget!" It is very easy to get caught up with the excitement and forget completely about that budget, but don't. Only shop for dresses in your budget range. You've done your homework. 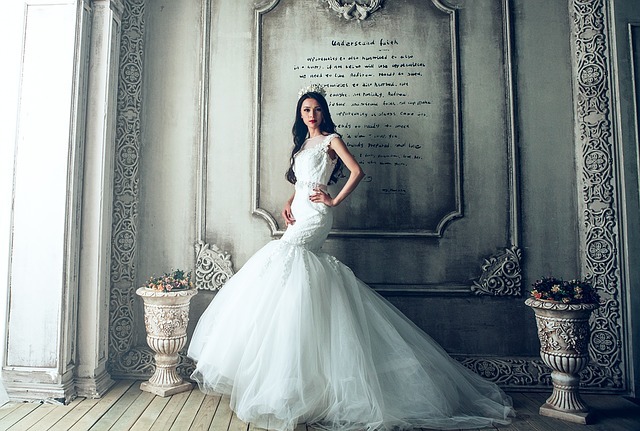 You have a good idea of the kind of wedding gown you want and you're ready to shop. But where? Well, for the bride who would like to have the shopping experience of a lifetime, the bridal salon or boutique is the best bet. In these shops the sales people are knowledgeable, there is a large inventory of gowns in all price ranges and the customer service is unbeatable (in most shops that is). The bridal boutique or salon will give you personalized attention. Their services range from selection to alterations. There will be suggestions from experienced sales people for the right veil, shoes and under garments. Now don't be fooled. Some of these shops charge for their service, and in general these shops will cost more than other alternatives. I can suggest that even if the shop's prices are out of your price range, the experience can be fun and you can find the right cut of gown and learn from the suggestions that are given. After you are armed with the knowledge you gain, you can then shop somewhere else for that particular gown you tried on, or for one very similar. Sometimes, if you ask, there are dresses that have been ordered by another bride, but have never been picked up. Some shops will sell you the dress for what is left owed on the dress. And some shops rent out gowns. 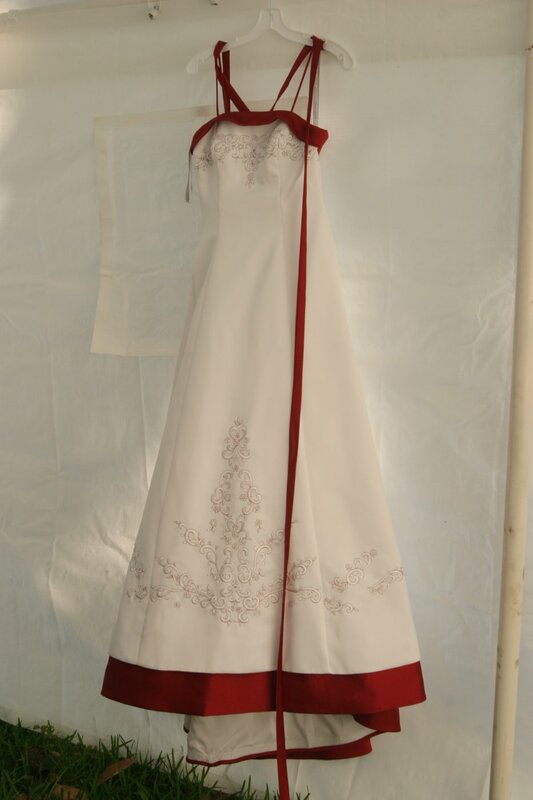 Rental is a viable option if it is not important to you to keep your dress as an heirloom. One last thought on boutiques. While you're there, take a look at some of the bridesmaid dresses that are offered. If there is one you really like, ask if it comes in white or ivory, because this can become your wedding dress. And last, but not least, wearing a gown that is handed down from your mother, sister, friend, or the groom's mother even, is a very sentimental option. More than likely the dress will need some altering, so be sure to use a seamstress that is very experienced. There may also be some discoloration to correct or some repair needed. Again, do your homework and be sure to use methods or professionals that are proven. If the dress is not worthy of restoration or alteration, perhaps the owner will agree to using it for a whole new custom creation. But tread carefully here! The sentimental value may be far greater than it is worth to take apart the gown. Be sure the owner knows that your intention is to dismantle the dress and only use parts of it for your new gown. Oh yes, I forgot to mention the internet. There are several sites that offer wedding gowns. Just be sure you know their policies on returns. You don't want to get the wrong size, color, or cheap dress and not be able to return it. Also, be sure to order it early in case you have to go another route in the event the gown is not what you thought it would be. Here's a shop that has a good reputation and raving reviews. Be sure you know the store's return and cancellation policy. Be sure to put the smallest deposit possible down on the dress and put that deposit on a credit card, that way if something goes wrong you have a means of getting your money back by disputing the charge. Be sure to have all the details of the sale in writing, preferably on the receipt. This should include the deposit amount, style number, size, color, the date ordered and the date of expected delivery. My BIGGEST piece of advice; Be sure to be comfortable in the dress. Don't just stand there in the dress. Move around in it. Walk in it, bend over in it, lift your arms, sit down and do any other motion that you think you might do on your wedding day while in the dress. If you are not comfortable in it, DON'T buy it. No matter how fantastic the dress is, you will be miserable on your wedding day and that is not the type of memory that you are trying to create.